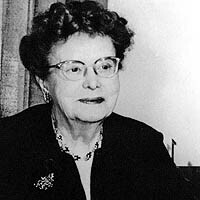 Dr. Ethel Percy Andrus was a long-time educator and the first woman high school principal in California, but is better known as the founder of AARP in 1958. She was born on September 21, 1884 in San Francisco, California. She earned a Bachelor of Philosophy (S.B. or Scientie Baccalaureus) degree from the University of Chicago in 1903 and the Bachelor of Science degree from Lewis Institute in 1918. She then went on to receive her Master's (1928) and Doctorate (1930) degrees from the University of Southern California. Andrus founded a separate organization, the National Retired Teachers Association (NRTA) in 1947. She realized that retired teachers were living on incredibly small pensions, often without any health insurance. She approached more than 30 companies to offer health insurance to retired teachers, before she found someone willing to take a chance on NRTA members in 1956. The organization then expanded its membership to all retirees and became AARP in 1958. Today, the NRTA is still a division of AARP, and serves as its educator community. AARP continues to follow Andrus' guiding principles: Collective voice, collective purchasing power, and the collective ability to do good and give back through service. AARP continues to follow the motto she created, "To serve, not to be served." She was inducted into the National Women's Hall of Fame in 1993. What I spent is gone; what I kept, lost; but what I gave away will be mine forever.